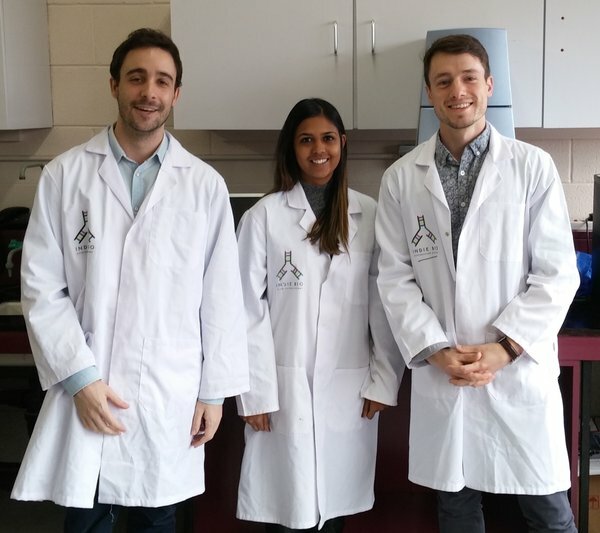 The Chinova co-founders in 2016: Emanuel Dinis, left, Natasha Dhayagude and David Brown. Fredericton-based Chinova Bioworks, which is making preservatives from chitosan, has raised a US$2 million (C$2.6 million) round of equity funding led by DSM Venturing and Rhapsody Venture Partners. The company issued a statement last week saying the participants in the round are: DSM Venturing, the venture capital arm of Dutch health and nutrition company DSM; Rhapsody Venture Partners, an early-stage VC fund based in Cambridge, Mass. ; AgFunder, a San Francisco-based crowdfunding group that backs agtech companies; and Charlottetown-based Natural Products Canada. Chinova uses chitosan in an anti-microbial agent, which it will employ as a natural preservative in such foods as juices. Chinova has developed three off-the-shelf formulations and is working with producers to develop customized formulations for specific food and beverage applications. Chitosan is a compound with a range of medical and industrial applications that is traditionally extracted from the discarded shells of shellfish. Mycodev Group – the Fredericton company Chinova was spun out of two years ago – has worked for years at producing chitosan from fungal sources, and now Chinova is using the substance in food production. CEO Natasha Dhayagude said in an email that the funding will help the company to build up its team and manufacturing capacity, which will help get the product to market. "We are working with a large number of clients, both [small and medium-sized] food and beverage producers as well as major multinationals in the industry," she said. "Closing this seed investment came at the perfect time so we can begin to scale in order to meet client supply demands." The startup has already validated the product with several leading food companies and will use the funding to scale production to meet demand. The company is well-travelled, having attended at least four accelerators, including programs in Ireland and Silicon Valley. AgFunder Chief Investment Officer Michael Dean said Chinova’s ability to produce an effective and totally natural product was a key consideration for his group in deciding to invest in the company. “While the food and beverage industries are Chinova’s initial focus, their proprietary technology to fractionate chitosan molecules to produce a customized, highly effective and natural anti-microbial product provides them with numerous multi-sector applications, which is incredibly exciting,” he said. Founded in April 2016 by Dhayagude and COO David Brown, Chinova has already received a pre-seed investment from the New Brunswick Innovation Foundation, the American venture capital fund SOSV, and the First Angel Network. Now it has an even broader group of investors. AgFunder has assembled a network of leading agricultural technology investors, who come together to back companies vetted by the organization. In 2015, AgFunder investors sank more than $1.7 million into Halifax-based indoor farming company TruLeaf Sustainable Agriculture. Natural Products Canada is an organization that supports companies across the country that develop products from natural sources. Chinova is the second Atlantic Canadian company NPC has invested in, having previously backed Charlottetown-based Island Water Technologies.